" Grow with the Partners, So with the World "
QGH SMART fly ash bricks making machine is one of our initiator products and has been widely accepted by customers. This product was brought to the market to establish the best product quality and market leadership. This fly ash brick machine is suitable for those who want more than 10000-12000 brick production per shift. With about 6% cement, you derive the strength of an M8 brick and since it is a mold-pressing machine, it does not lose pressure in any regard. It is to be noted that we maintain an oil pressure of 160 bar. QGH SMART fly ash brick machine comes with a 40-ton hydraulic pressing capacity with the capacity to produce 6 bricks per stroke. It has 6 cycles per minute and can support a pallet size of 450 mm x 300 mm x 18 mm. The set up has the provision for an optional pre-feed system and 1000 kg pan mixer. The machine can make different fly ash bricks quantities depending on the brick size. QGH 14 fly ash bricks machine is one of our builder series products and has been widely accepted by customers. This product was brought to the market to establish best product quality and market leadership. This fly ash bricks machine is suitable for those who want more than 14000-15000 brick production per shift. With about 6% cement, you derive the strength of an M8 brick and since it is a mold-pressing machine, it does not lose pressure in any regard. It is to be noted that we maintain an oil pressure of 160 bar. QGH 14 fly ash brick making machine comes with a 50-ton hydraulic pressing capacity with the capacity to produce 6 bricks per stroke. It has 6 cycles per minute and can support a pallet size of 600 mm x 300 mm x 18 mm. The setup has the provision for an optional pre-feed system and 1000 kg pan mixer. The machine can make different fly ash bricks quantities depending on the brick size. QGH 17 ash brick machine is one of our builder series products and has been widely accepted by customers. This product was brought to the market to establish best product quality and market leadership. This ash brick machine is suitable for those who want more than 16000-17000 brick production per shift. With about 6% cement, you derive the strength of an M8 brick and since it is a mold-pressing machine, it does not lose pressure in any regard. It is to be noted that we maintain an oil pressure of 160 bar. QGH 17 Ash Brick Machine comes with a 50-ton hydraulic pressing capacity with the capacity to produce 6 bricks per stroke. It has 6 cycles per minute and can support a pallet size of 600 mm x 300 mm x 18 mm. The setup has the provision for an optional pre-feed system and 1000 kg pan mixer. The machine can make different fly ash bricks quantities depending on the brick size. QGH 25 fly ash bricks machine is one of our star products and has been widely accepted by customers. This product was brought to the market to establish the best product quality and market leadership. This fly ash brick machine is suitable for those who want more than 15000-20000 brick production per shift. With about 6% cement, you derive the strength of an M8 brick and since it is a mold-pressing machine, it does not lose pressure in any regard. It is to be noted that we maintain an oil pressure of 160 bar. QGH 25 fly ash brick making machine comes with an 80-ton hydraulic pressing capacity with the capacity to produce 6 bricks per stroke. It has 7 cycles per minute and can support a pallet size of 800 mm x 300 mm x 18 mm. The set up has the provision for an optional pre-feed system and 1000 kg pan mixer. The machine can make different fly ash bricks quantities depending on the brick size. QGH 25A twin fly ash brick plant is one of our star products and has been widely accepted by customers. This product was brought to the market to establish best product quality and market leadership. This fly ash brick plant is suitable for those who want more than 23000-24000 brick production per shift. With about 6% cement, you derive the strength of an M8 brick and since it is a mold-pressing machine, it does not lose pressure in any regard. It is to be noted that we maintain an oil pressure of 160 bar. QGH 25A Twin fly ash brick plant comes with an 80-ton each hydraulic pressing capacity with the capacity to produce 12 bricks per stroke. It has 7 cycles per minute and can support a pallet size of 800 mm x 300 mm x 18 mm. The set up has the provision for an optional pre-feed system and 1000 kg pan mixer. The machine can make different fly ash bricks quantities depending on the brick size. RT 3 concrete block & Paver making machine is one of our builder series products and has been widely accepted by customers. From this Block making machine you can make fly ash bricks, interlocking pavers, solid blocks, colored pavers. This Concrete brick making machine makes 2400 Bricks/Hour, 3360 Solid Block/Hour, 2400 Interlocking Paver Block/Hour. Operating cycle of this machine is 14-20/s and pallet size is 600×200 mm. You can use this cement block making machine for multiple type brick & block making. These machines are made in India with robust construction with perfect finish product output. RT 4C concrete block making machine is one of our builder series products and has been widely accepted by customers. From this Block making machine you can make fly ash bricks, interlocking pavers, solid blocks and hollow blocks. This Concrete brick making machine makes 2880 Bricks/Hour, 4320 Solid Block/Hour, 2880 Interlocking Paver Block/Hour, 1260 Hollow Blocks/Hour. Operating cycle of this machine is 15-30/s and pallet size is 900×550 mm. You can use this block making machine for multiple type brick & block making. These machines are made in India with robust construction with perfect finish product output. RT 6C block making machine is one of our builder series products and has been widely accepted by customers. From this machine you can make fly ash bricks, interlocking pavers, solid blocks and hollow blocks. This Concrete block making machine makes 3600 Bricks/Hour, 5040 Solid Block/Hour, 3600 Interlocking Paver Block/Hour, 1800 Hollow Blocks/Hour. Operating cycle of this machine is 15-25/s and pallet size is 900×700 mm. From this block making machine you can make multiple types of bricks and blocks. RT 9A concrete block making machine is one of our builder series products and has been widely accepted by customers. From this machine you can make fly ash bricks, interlocking pavers, solid blocks and hollow blocks. This Concrete block making machine makes 6000 Bricks/Hour, 8400 Solid Block/Hour, 6000 Interlocking Paver Block/Hour, 3240 Hollow Blocks/Hour. Operating cycle of this machine is 15-30/s and pallet size is 1350×700 mm. From this block making machine you can make multiple types of bricks and blocks. RT 15A concrete block making machine is one of our builder series products and has been widely accepted by customers. 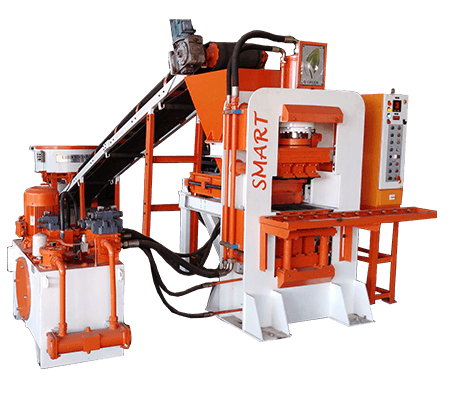 From this machine you can make fly ash bricks, interlocking pavers, solid blocks and hollow blocks. This Concrete block making machine makes 10800 Bricks/Hour, 14400 Solid Block/Hour, 9600 Interlocking Paver Block/Hour, 5400 Hollow Blocks/Hour. Operating cycle of this machine is 15-30/s and pallet size is 1350×1050 mm. From this concrete block making machine you can make multiple types of bricks and blocks. Easy To Use – Customers can Operate machines easily. Customizable designs as per your need.